This post is part of YummyMummyClub.ca‘s support of the Dove® Unstoppable Moms for Unstoppable Girls Contest. I received compensation as a thank you for my participation. This post reflects my personal opinion about the information provided by the sponsors. 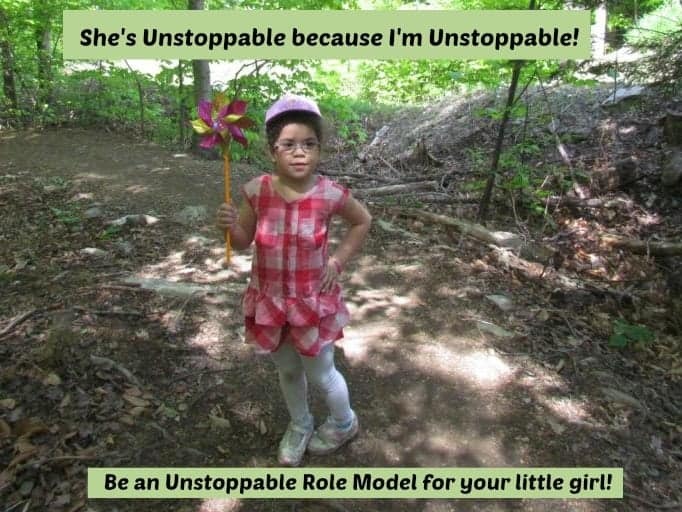 Go to www.UnstoppableMoms.ca to enter by sharing how you inspire girls to reach their full potential. Too often, young girls feel so insecure about their bodies that it prevents them from doing an activity that they love. This is so sad because these activities not only give girls a chance to form life-long friendships and learn new skills, but can be really beneficial to self-esteem if they can overcome the insecurities. I know how they feel! Are you an unstoppable mom? When I was 15, I started playing tennis. I loved that activity! It was fun, speed and felt so good! But I had some weight issues. When I put the shorts on, I felt so ugly! The look of the others made me feel miserable. I was good at this sport! I won nearly all the time and my coach signed me up for tournaments! But I quit! I was so scared that the crowd found me ugly and fat in the shorts. I couldn’t stand it! I regret it today. I wish my parents encouraged me but they didn’t. “Fat girls do not wear shorts,” they used to say. I often wonder how far I could have gone in the sport if I hadn’t been too insecure to stay with it. Sadly, 6 out of 10 girls avoid activities because they feel badly about the way they look. Moms are one of the most powerful forces in a child’s life. With the right support, they can do a lot to help build up a young girl’s self-esteem. I think the most important thing moms and role models can do is let their girls know that they can do anything they set their mind to. Whether it’s singing in a chorus concert or swinging a bat on a baseball team or skiing; girls shouldn’t be made to feel like they have to fit into a particular mold. Too often, young girls are told they can’t play certain sports because they’re supposed to be more feminine, and that’s just sill. You can be a girly girl and still pitch a ball or ski like a pro. Today, I show my daughter that she can be anything by going after my own dreams. I am unstoppable, plain and simple. Despite many challenges in my life, I’m still standing and still reaching for my goals. However, being an unstoppable role model is more than just showing the world that you can go out there and achieve no matter what you’re going through. It’s also about showing that you can reach your goals without stepping on others. It’s about letting children know that kindness plays just as much a role in success as assertiveness. Being a role model is also about showing that sometimes things don’t work. Share YOUR story about a time when you thought about quitting an activity you loved because of how you felt about your body and let them know how you think moms/role models can better support girls to participate in activities. You have until June 13, 2013 to enter. You could win $2,500 for yourself and $2,500 will be donated to help raise a girl’s self-esteem. in-thing these days and many people have been spotted wearing them. Good for you Cinny. I didn’t have that courage! I bet you were awesome at tennis! You are a powerhouse in your own way now Olfa. I see that in all that you do. I am sure that your daughter sees the same thing we do. You don’t back down from a challenge and you are a smart business woman. Hugs. Your girly will remember that. I was indeed but gave up! Thanks Paula for those kind words!! I am glad you see me that way!! My husband calls me: a Tornado!! lol!! I love this post because it shows just how much of an impact what we do when our children are young will have on them! I hope to give my children the power to do everything they want. Great post! That’s sad that you gave up something you loved and were good at because of physical self-confidence issues. It’s such an important issue to build up our girls, isn’t it? Unstoppable indeed! I look at pictures of me when I was in high school and thought I was fat – and wonder what in the world I was thinking. The insecurity of how I felt about my body kept me from really reaching out and connecting; and I want to teach my daughter differently! Thank you for this, I am thankful you are addressing this and letting us know about the contest! Thanks Jen! It is important to address it! This is a great campaign and having two girls, I try my best to be a great role model!There is no handbook but, we can only do our best. It’s hard to be a parent in this crazy world. I try to protect my kids as much as possible even from the images on t.v. and magazines. I want my children to have role models with the right morals, etc. Yes it is hard! There are so many things out of our control. We do our best! This is an AWESOME message!! Good for them for sponsoring such an important topic for girls today!! I love this – I hope I can be a great role model for my girls! Growing up the only thing I ever heard my mom tell me regarding my body was when I was 19 and all she’d ever said was you are too thin (almost became anorexic). That was it, never a “are you Okay?”. I agree it is important to be a good role model. Absolutely! This is a great campaign and it’s so important to teach our children to be unstoppable! I have been insecure about my body all of my life, even when I was thin before I had my babies! I try very hard not to let it show so that it doesn’t rub off on my girls. I don’t mind wearing shorts, but I have a hard time with dresses. Adorable little girl and great job being an unstoppable woman! How sad that you didn’t continue on with tennis, because you were insecure about your body! I hope you have continued on with tennis. I try to be unstoppable at the gym, and do my best to make myself strong and fit. Sadly Jenna, I moved on and didn’t want to continue with Tennis! Happy you are unstoppable at the gym! I had the same issues when I was young, it’s horrible what we can do to ourselves and dangit I’m working hard to show my girls they can do and wear anything they want and be comfy if they set their mind to it.